This exam is conducted by Staff Selection Commission. It is an open competitive Computer Based Examination (CBE) which is conducted in order to recruit candidates for the post of Junior Engineers - Group ‘B’ Non-Gazetted Posts. Recruitment is done for various government departments and ministries like the Central Water Commission, Department of Quality Assurance (Naval), National Technical Research Organisation, the Postal Department, etc. 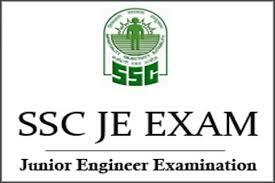 The official notification for the SSC JE 2018 Exam at SSC's official website i.e. www.ssc.nic.in. Tier I - the Tier I exam is conducted from 22nd January 2018 and is held for multiple days. Tier II - the Tier II exam will be conducted on 29th April 2018.